HILLTEN BANQUET HALL COMPRISES 2 HALLS. Both Halls are fully air- conditioned, fully carpeted and fully curtained to match cozy five star ambience. 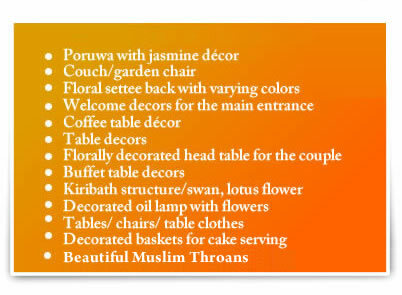 A party may obtain also two halls together for the same function, in cases of high guest capacity. Hillten Banquet Hall is a Full Service Caterer, which specializes, in traditional Sri Lankan, Indian, Chinese and Western cuisine. Delicious vegetarian menus too are available. Garden fresh vegetables and fresh meat and fish items would enrich and overflow you with maximum aesthetic contentment and the delectable deserts prepared by our experienced chefs would drive your mind into the intensity of fulfillment. Only Muslims can bring their own traditional Sawan Food, from outside caterers of their choice. © HILLTEN BANQUET HALL 2011. All Rights Reserved | Solution by SLT.